Milestones allow you to organize issues and merge requests into a cohesive group, optionally setting a due date. A common use is keeping track of an upcoming software version. Milestones can be created per-project or per-group. Note: You need Master permissions in order to create a milestone. You can find the milestones page under your project's Issues ➔ Milestones. To create a new milestone, simply click the New milestone button when in the milestones page. A milestone can have a title, a description and start/due dates. Once you fill in all the details, hit the Create milestone button. You can create a milestone for a group that will be shared across group projects. On the group's Issues ➔ Milestones page, you will be able to see the state of that milestone and the issues/merge requests count that it shares across the group projects. To create a new milestone click the New milestone button. The form is the same as when creating a milestone for a specific project which you can find in the previous item. In addition to that you will be able to filter issues or merge requests by group milestones in all projects that belongs to the milestone group. You will be able to promote a project milestone to a group milestone in the future. No Milestone - only show issues or merge requests without a milestone. Started - show issues or merge requests from any milestone with a start date less than today. Note that this can return results from several milestones in the same project. Milestone statistics can be viewed in the milestone sidebar. 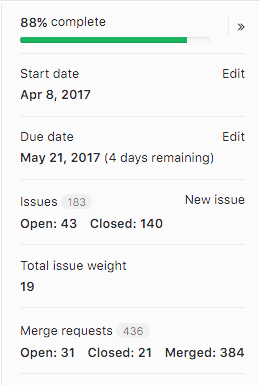 The milestone percentage statistic is calculated as; closed and merged merge requests plus all closed issues divided by total merge requests and issues. Quick actions are available for assigning and removing project and group milestones.